With St. Patricks Day just around the corner, I figured that it was time to share a deliciously GREEN recipe with you all! Low calorie AND low carb of course, because I mean….is there any better way? During my weekly Kroger run, I came across these tortilla wraps and just had to see what they’re all about. After reading the package and seeing that each wrap only contains 50 calories and 5 g net carbs, I just couldn’t pass up that offer! Immediately, my mind starting firing off with ideas on how to incorporate these low carb goodies in just about EVERYTHING. To begin making these Low Carb Spinach Artichoke Dip Cups, I used a round glass to cut out rounds of the tortilla. I was able to get 4 rounds from one tortilla, each around 3 inches in diameter. I then lined a mini cupcake pan using the tortilla rounds to make little dip cups. 4 tortillas were used to make 16 cups. Because the entire tortilla wasn’t actually used to make the cups (scraps were leftover after 4 rounds had been cut out from each tortilla), I did manual calculations to ensure the nutritional info was correct. The package states that one wrap (45 g) contains 5 g net carbs and 50 calories. 4 rounds weigh 28 g which totals 0.8 g net carbs and 8 calories per tortilla round. BOOM! I lightened up the spinach artichoke filling by using 1/3 reduced cream cheese. Keeping those cals low, ya know. 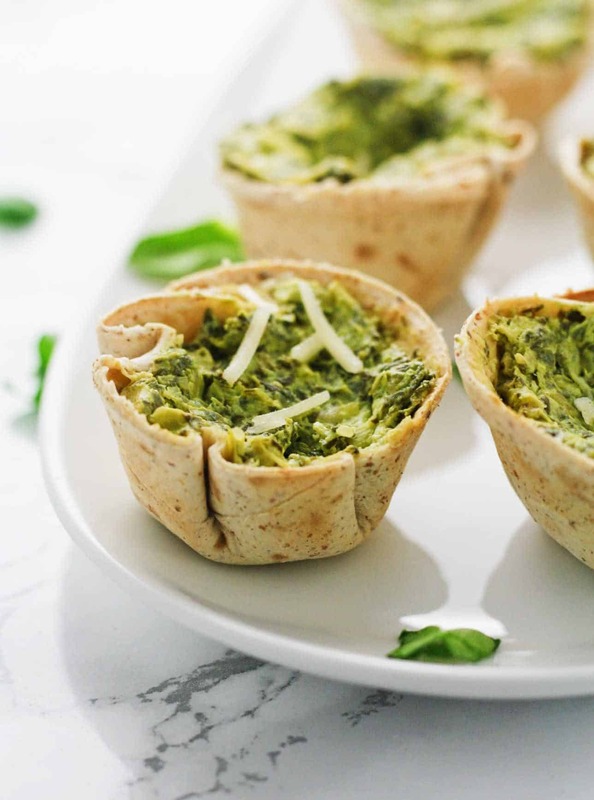 Please your crowd with these Low Carb Spinach Artichoke Dip Cups. Super easy and highly addictive! Preheat oven to 375 degrees F. Using a round glass or 3 inch round cutter, cut out 4 circles from each tortilla wrap, making 16 rounds. Line a mini muffin pan with the rounds to make cups. Add the spinach, cream cheese, artichoke hearts, minced garlic and salt to the bowl of a food processor and pulse until the mixture is fully incorporated. Add about a tsp of the mixture to each cup and bake in the oven for 20-25 minutes. Set aside to cool and enjoy! If you are using thawed frozen spinach, be sure to drain before adding to food processor. New fan here! Definitely gonna make this tomorrow! I hope you love them, Celine!